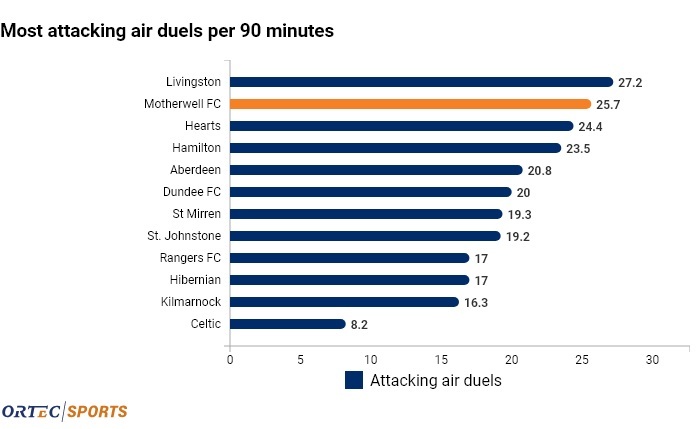 If you are enjoying this piece and the rest of the tactical and statistical analysis we provide for Scottish Football, consider donating to our GoFundMe to purchase comprehensive data so we can continue to break down the stats and tactics behind football in Scotland. Right…an article about Motherwell’s passing. They hit it high and long, sometimes it works, for the most part it doesn’t…done…no…not done… okay seriously, here is an article about Motherwell’s passing, because since the winter break the Steelmen have started doing something different. Subtle and nuanced are not words that would be used to describe Motherwell’s style which is more function over flair.They are often tarred with the moniker of being Long Ball Merchants and Hammer Throwers and a stat that would back that up is their number of Attacking Aerial Duels. No surprises here then, Motherwell have loved nothing more than hitting the ball up to Main for him to knock the ball down for the runner. You can see in this Aerial Duel map from their defeat to Hamilton earlier in the season that these duels are not coming from crosses and corners. When you consider that the only successful Air Duel in the 18-yard box was 5’ 8” Gael Bigirimana it’s fair to say that this tactic is not paying off like it used to last season. We don’t have the same players as last year, We don’t have Louis Moult, Craig Tanner, Cedric Kipre, Chris Cadden, Trevor Carson. So you can’t play the same way. Our front players haven’t done it. They haven’t been physical so there’s no point playing a physical way. We have had to try and change it. Stephen Robinson’s words after their Scottish Cup exit to Ross County peaked my interest. You could argue that Motherwell have been physical, but it’s clear that their style is just not working like it did last season. After a winter break it looks like Motherwell have been working on an alternative and things are changing. The most obvious change is their formation. Robinsons favoured 3-5-2 has been replaced with a 4-4-2, or at least on paper it has. It’s more of a 4-3-3 with the LM pushing on and the RF pushing wide. The RM moves inside allowing the full backs to push up and look for the overlap. The changes mean that Motherwell can still have their 3 in the middle that Robinson prefers but now have more options in the wide areas. The introductions of youth player Jake Hastie and loan signing Gboly Ariyibi have helped the squad adapt to this change, both offering something different to the existing squad and proving to be a handful for SPFL premiership defences. The change in formation hasn’t changed their penchant for going long, but the target has moved. Whereas earlier in the season the ball was hit into the central area looking for the striker to either hold the ball up or flick on to the supporting striker now the focus is now much wider. The change in formation has helped facilitate this. In a 3-5-2 the wide players are putting a shift in coming back to make a back 5 when out of possession and then bombing on for counter attacks. Having a flat back 4 has meant that the wide attackers now have fewer defensive responsibilities and can sit higher up allowing for Motherwell to break much quicker, something that was put to devastating effect against Livingstone at the weekend. Compare this to their build up play in more recent matches, its much slower, the wide players are doubling up and not as tightly marked when they receive the ball. This allows them to keep possession better and allow the attacking players to find the spaces and get into dangerous positions. Ultimately Motherwell have managed to make some subtle changes that don’t change too much in the way they play but gets the best out of the players that are at Robinson’s disposal. Four wins in their last five would suggest that the changes are working. Arguably its been a good run of games for them and a win at home to Hibs is not be sniffed at but the last three games in February will be a real test to see if Motherwell have truly turned a corner. Okay Statto, how come you’ve written about Motherwell relying on long passing but not used a long passing stat? …well…a look at their long passes per game may raise a few eyebrows. So, either Motherwell don’t play long ball football (they do), or stats are useless (they’re not). A look behind the numbers will clear up why they appear so far down the table. Firstly, long ball can mean anything over 30m (32.8 yards) so that would include most crosses so it’s difficult to determine anything stylistically from long ball statistics. Secondly, something that is indicative of playing long ball football from the back is low possession. Long balls of any kind are really ineffective and even for clubs that do it well it comes with a low success rate. With that in mind in stands to reason that teams that attempt long ball football when playing out from the back won’t necessarily come high in a long passes chart, can’t hit a long ball if you don’t have the ball. Stats only make sense in context and if not applied correctly can mislead. It would have been quite easy for me to write 500 words based on one statistic and claim that ‘Motherwell are misunderstood’ but instead I’ve written 1000 about how Motherwell play long ball football. Well played statistics…well played. This article is written with the aid of data and graphics from ORTEC. Modern Fitba currently have a short trial with ORTEC to use their services. We want to purchase data from ORTEC on a permanent basis and continuing covering Scottish football with advanced statistics. We need your help in order to raise the funds necessarily.